So we all know in this digital age it is easier and easier to share content. For some reason some people, The Pirates, like to share full videos and photos with the world without any consideration for the hard work and money that went into making a great spanking scene. At SpankingTube.com we do our best to not approve and delete all pirated content that we know is illegally shared. We have had only a few take down notices and over the past 6+ years have deleted thousands of videos that did not make it on to the site because we knew or suspected they were illegally shared without permission from the content producer. So besides running a tube site we also run our own spanking membership sites. Just like everyone else in the membership or clip sale business we have to fight to have our content taken down from hundreds or even thousands of sites that share our content illegally. The time it would take us to scour the internet, find all of our illegally shared content, and send out all of the DMCA notices would drain us financially. It just can’t be done. 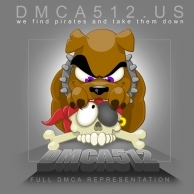 That is were a company called DMCA 512 has stepped up and taken on this job for us. It has been a godsend. They have worked tirelessly to reduce the amount of our illegally shared content on the internet and have taken down many websites that ignore their DMCA take down requests. I know many of you already use DMCA 512 but I wanted everyone to know the great job they do for us and if you need someone to handle your DMCA request DMCA 512 would be a great choice.